It might look something like Kaprosuchus saharicus, one of five new crocodilians described in a new paper by Sereno & Larsson. I heard about a few of these beasties at SVP, but they had very informal names: "DuckCroc," "BoarCroc," "DogCroc," etc. 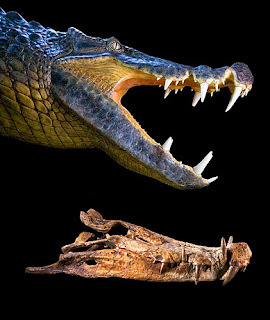 We've all heard about Anatosuchus before, but it gets a full description in this paper. Cretaceous Africa really saw some bizarre creatures: dinosaurs that were converging on gharials, giant big-nosed crocodiles that ate dinosaurs, and now these buggers, at least one of whom I can see chewing on smaller dinosaurs. National Geographic also has some life restorations, though I can't speak to their quality. I'm glad that its informal name was converted for its formal name. 'Boar Croc' for a creature like that is perfect. Sereno called them BoarCroc, DogCroc, and the like in order to interest the layman (read: children) in paleontology. Its rather heartwarming, all in all.